Amy Beach’s monumental Piano Concerto shows her at the height of her powers as both composer and pianist. This weekend Brandeis-Wellesley Orchestra will perform it with Randall Hodgkinson soloist and Neal Hampton conducting, at Houghton Chapel Wellesley on Saturday at 7:30 and at Slosberg Recital Hall, Brandeis on Sunday at 7:00. Forty-five minutes before each concert, Wellesley music department chair Claire Fontijn and I will give a talk. These concerts crown the area events celebrating the 150th anniversary of Beach’s birth. I asked Hodgkinson how this performance came to be. Claire Fontijn had asked me to play for one of her classes a couple of years ago. So I played some Lili Boulanger, and Clara Schumann, and Fanny Mendelssohn Hensel. And after that we started talking, and she had an idea, because there was this anniversary coming up, Beach’s 150th. So we ended up doing it, it’s really great, I like it! I didn’t know the piece before, the only work by her that I had done is the Piano Quintet, a real masterpiece. This concerto is a very serious undertaking. Beach must have been an incredible pianist. It’s too bad there are no recordings of her playing; she must have been tremendous. As I was learning this piece, I started thinking about years ago when I won that American Music Competition, and I set out to play American concertos. And a lot of the orchestras didn’t want to do contemporary music. So I did the Barber a couple of times, and I often did the MacDowell Second Concerto. So the Beach is an example of music from that era that I wish I had known sooner, because it really should be played, at least as much as the MacDowell. I recounted last week that the success of her Grand Mass launched Beach as a nationally recognized composer. She received several commissions, and while her Gaelic Symphony was not one of them, the BSO readily agreed to perform it in 1896. It achieved acclaim and she continued her upward trajectory with the Piano Concerto, composed in 1899. The next year the BSO gave its premiere, with Beach as soloist. Beach biographer Adrienne Fried Block has advanced a view of Beach’s concerto as a metaphorical narrative of Beach overcoming her oppression by both her mother and her husband. Beach later wrote that a piece of music could indeed be “a veritable autobiography.” Block recounts the many restrictions that mother Cheney imposed on Amy in childhood and adolescence, including withholding or limiting access to the piano, and denying the European training that was then obligatory for any musician who wanted to reach artistic heights. 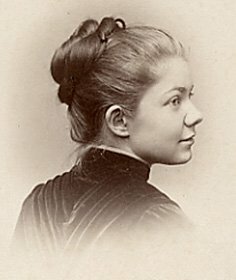 When the 18-year-old was married to the 42-year-old doctor Beach, in 1885, her aspirations as pianist were dashed. Amy Cheney became Mrs. H.H.A. Beach and was not to earn money as a pianist. Public performances were limited, usually to one or two a year, and were to benefit charity. She became a talented society wife, not a professional. The presence of that throng of people was an inspiration. And as for the orchestra (it was my first experience with one) no words can tell the pleasure I felt performing with a band of instrumentalists, each member of it himself such a musician as to sense my wishes more quickly and surely than the greatest conductor could convey them. I can only compare my sensations with those of a driver, who holds in his hands the reins that perfectly control a glorious, spirited team of horses. One must live through such an experience to properly appreciate it. In the concerto, then, Beach recalls her sorrow (and perhaps fury) at having to curtail life as a musician on the stage, her continued desire for the role of a performer, and her rapturous joy when she is able to achieve it. The clues for this interpretation are found in her songs which she drew from as thematic material. The first movement (Allegro moderato) draws on her song “Jeune fille et jeune fleur,” setting a Chateaubriand poem about a young woman being lowered into her grave, while her father grieves. We might infer that Dr. Beach “buried” his young wife’s performance ambition. The second movement expands Amy’s setting of a poem by Dr. Beach, “Empress of Night.” She dedicated the song to her mother, leading Block to observe that the melody (sounded by the orchestra) represents Amy’s mother and husband while the solo piano (Amy herself) creates an elaborate and exuberant expression around it, refusing to be contained or, we might note, running rings around them in its perpetuum mobile. Her song “Twilight” provides material for the Largo third movement. The poem presents a gloomy landscape, and the song’s somber melody is amplified rhapsodically, by the piano’s elaborations as stormy emotional outbursts. The entire song is employed, except its last line, which turns to major and the brightness of returning morning. This is anticipated in the sustained chords of the ending, which connects to the finale, described by Beach as a “vivacious rondo.” There the piano dominates with brilliance and energy, with a vigorous mazurka-like second theme, the many bravura flourishes leave no doubt that Beach has conquered all obstacles. Block’s theory addresses questions that are obvious to readers of Beach’s life and achievement. How did she feel as an 18-year-old marrying a man older than her father? Surely on some level she felt grief and loss, putting aside her hopes and ambitions as a concert pianist and taking up the role of doctor’s wife. The concerto roils with emotion, with turbulent conflict, sorrow and loss, and joyous victory. While no single narrative can be proven as an underlying program, this one does much to suggest the rich inner life of the pioneering woman who worked hard to balance the roles of daughter, wife, composer, and pianist.